The reinvented, sixth-generation Chevrolet Camaro is all-new, and the 2017 Camaro ZL1 was purpose-built to take on the most advanced sports cars on the road, whether on street or track. Powering the newest ZL1 is a supercharged 6.2-liter V8 engine. The V8’s estimated 650 hp and 650 lb/ft of torque make the 2017 ZL1 the most powerful Camaro ever. The ZL1 can be equipped with a six-speed manual transmission or a new 10-speed automatic. Offered in fixed-roof coupe and soft-top convertible body styles and built to dominate, the 2017 Camaro ZL1 gets from zero to 60 mph in 3.5 seconds and covers a quarter mile in 11.4 seconds (at 127 mph). The platform is lighter and stiffer than that of the previous generation, and the ZL1 is now equipped with an electronic limited-slip differential, Magnetic Ride Suspension, and Performance Traction Management. The new ZL1 brakes from 60 mph to zero in 107 feet, thanks in part to Brembo® six-piston front and four-piston rear brakes and the grip of Goodyear Eagle F1 Supercar tires wrapped around 20-inch forged aluminum wheels. 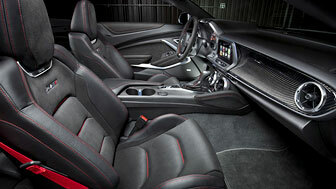 The ZL1 features a driver focused cockpit with standard RECARO performance seats, and a suede-wrapped steering wheel and shifter. There’s also an emphasis on technology. The available Chevrolet Performance Data Recorder gives you performance data and logs video of your driving. The same system also has a valet mode, so you don’t have to worry what’s happening to your ZL1 if you ever hand the keys over. You also get Android Auto™ and Apple CarPlay™ to help manage your smartphone while driving, and you can stay connected with OnStar® 4G LTE and built-in Wi-Fi. If you drive the ZL1 convertible, you can lower the automatic soft-top while driving at speeds up to 30 mph. “The Camaro ZL1 offers supercar performance with daily-driver refinement, a combination that stacks up against any other sports coupe – at any price – around the world,” said Steve Majoros, director of Chevrolet marketing. The new 2017 Camaro ZL1 will be available later this year. Check back for more product details and stop in for the latest on availability, so you can be one of the first to see and drive the new ZL1 when it arrives.